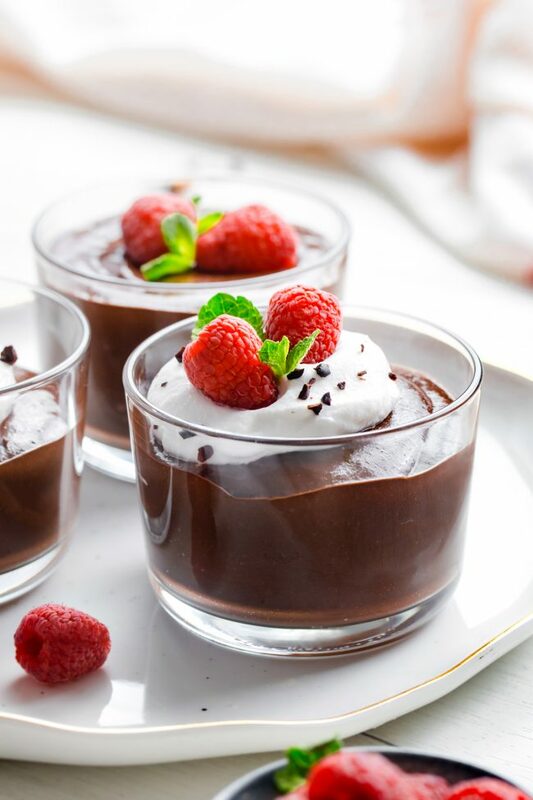 This chocolate chia pudding is smooth, creamy and no-cook. It’s sweetened with maple syrup, made with coconut milk and is paleo and vegan. Tastes just like regular pudding! If you’re looking for something super easy and delicious for Valentine’s Day, this is a great option! You just blend everything together in a blender and chill. We never really do anything for Valentine’s Day but it is a great excuse to make something chocolaty. 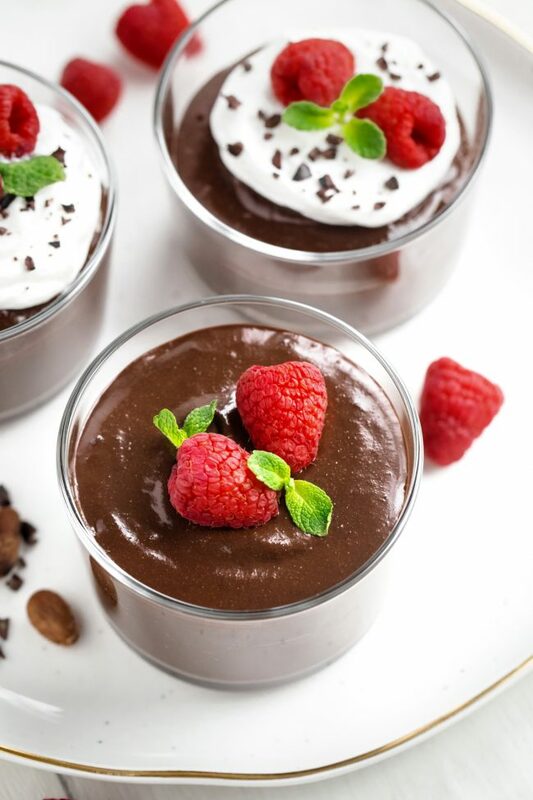 These raspberry molten lava cakes and this paleo chocolate cheesecake are also great for the day but require a bit more time. Most chia puddings I’ve had are lumpy, slimy and in my opinion, totally unappetizing. I know lots of people love them so maybe I just have issues. The texture is just too unusual for me. If you’ve tried a chia pudding recipe that isn’t like that, please share the link in the comments! I’d love to try it. In all the other recipes I’ve tried (which really hasn’t been that many), you stir in the whole chia seeds after everything else has been combined. In my recipe, the chia seeds get pulverized along with everything else so the end result is totally smooth and like regular pudding. This isn’t really one of those super healthy chia puddings. This is more like a traditional pudding that’s thickened with chia seeds instead of cornstarch or arrowroot. I liked the idea of using dates in this but it was late when I had my craving. Björn was sleeping and pureeing dates in the blender isn’t exactly quiet. So this chocolate chia pudding recipe is maple-sweetened! It’s also made with coconut milk so it’s still a bit healthier than your average pudding. I think it’s great on its own but added some raspberries (which I always love with pudding) and cream just to make it look prettier. Some chopped nuts or strawberries would also be nice! 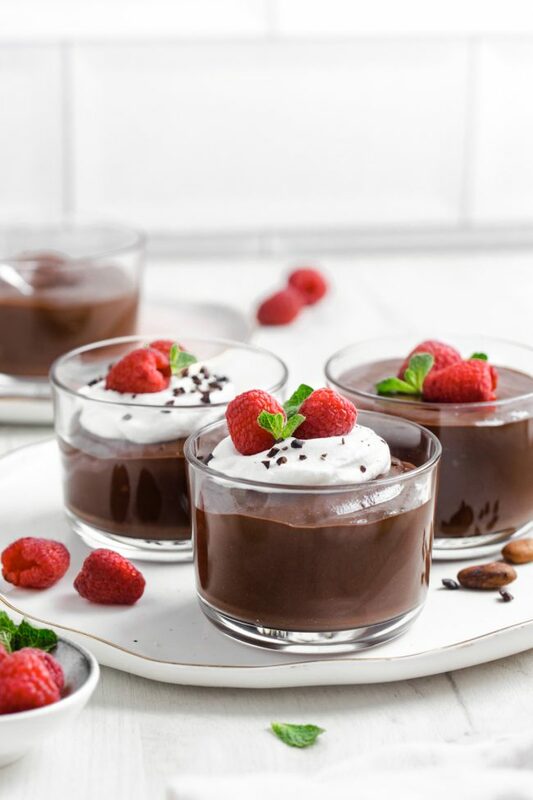 Questions about this chocolate chia pudding? What can I use in place of the canned coconut milk? Canned coconut milk is somewhere around 24% fat, which is way more than almond or any other kind of milk. So I don’t think any kind of milk (dairy or non-dairy) would work, unless you don’t mind it being much thinner. For a non-vegan and non-paleo version, you could use whipping cream, which is around 30% fat. I’ve only tried this pudding recipe with maple syrup. Another liquid sweetener should probably work for a non-vegan version! Whether or not you’ll be able to taste the honey depends on what kind you use, as well as what cocoa powder you use. So if you use honey, keep in mind that you might be able to taste it a bit. Can I use X type of cocoa powder? You can use any kind of unsweetened cocoa powder. I used Dutch-process because I like the dark chocolaty taste but natural cocoa powder (like Hershey’s) or raw cacao powder will work, too. Can I make this less rich? You could use a combination of canned coconut milk and another type of thinner milk. I think you could maybe use all but 1/2 cup of the canned coconut milk and use almond milk (or whatever) in its place. I haven’t tried it but that’s my guess! Can you taste the coconut? Not at all! At least with the coconut milk and cocoa powder I used. Do I need a high-speed blender? I don’t recommend trying this with a regular blender. I don’t believe it’s runny enough. A food processor would work, but only if you don’t mind the lumpiness you’d get from whole seeds. I could be wrong but I don’t think a food processor would make the pudding totally smooth. Blend everything together in a high-speed blender at high speed for about 1 minute until totally smooth. There should be no lumps of chia seeds. Pour into serving cups (it yields about 2 1/2 cups pudding) and chill for about 4-6 hours or until thickened. Keep refrigerated for up to 3 days. 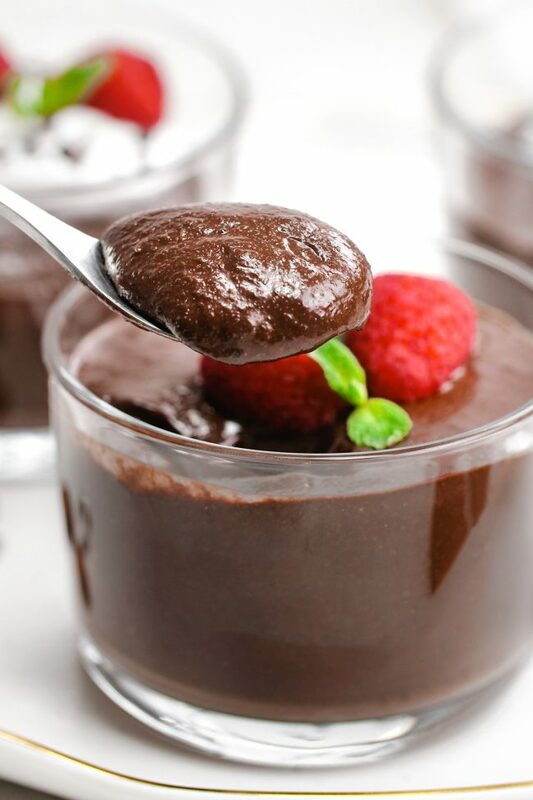 36 comments on “Chocolate Chia Pudding (paleo, vegan)” — Add one! This sounds so easy for such a decadent and delicious looking dessert! Yum! This looks like a great recipe for Valentine’s Day, I love that it’s healthy! Love how simple and easy this is to make. Can’t wait to try it. This has to happen at my house! Love it! I can’t believe this is vegan, it looks so delicious! I can’t wait to try it! I love that this dessert is perfect for every Valentine’s lifestyle. Love this idea! A sweet and yummy, but healthy snack! I am not a big fan of chia, but I used it because it is so healthy. This is the first time I try chia pudding and IT IS SOOO GOOD! This is a keeper. Thanks for the recipe. Aww, yay! I’m so glad that you enjoyed it and that you’ll be making it again. :) I’m also not a huge chia fan but in this pudding it’s great. Thanks for your comment! This looks so smooth and delicious. Can’t wait to make a batch and add some raspberries! Anything chocolate is worth a shot in my world! Can’t wait to give this a try! Easiest pudding ever! Love that it’s sweetened with maple syrup instead of an artificial sweetener or regular sugar. Doesn’t the maple syrup still make it high carb? I have never thought I would like pudding with little black seeds staring at me. That just doesn’t look tasty at all. Ha!! Funny thing I almost didn’t read your recipe after seeing the name. Ha! !